The Inov-8 X-Talon 200 offers an impressive grip on all surfaces, according to a huge number of runners. Most runners applauded the shoe for being lightweight and flexible. Breathable forefoot mesh and DWR coating keeps the foot dry. This shoe has a roomy toe box but not bulky based on several comments. The Talon 200 has a narrow lacing system for a more secure and snug fit. Some runners complained that the Talon 200 is not as durable as expected. Based on some comments, this shoe needs added underfoot protection. The Inov-8 X-Talon 200 is a lightweight running shoe for racing and obstacle course running. It provides impressive grip and protection on all surfaces. This trail running shoe is ideal for those who are looking for a flexible and water-repellent shoe at a reasonable price. The Inov-8 X-Talon 212 is legendary! So is "precision fit", which for some people (including me) is simply too narrow and uncomfortable in the long run (pun intended). As a long distance trail runner, my first Inov-8 shoes were the X-Talon 212 standard fit (half a size up). It was a perfect snug fit and instant romance. The 8 mm lugs gave unrivaled grip on pretty much any terrain (sans road) and excelled in slippery conditions. I did my first trail 50-miler in a pair of 212 standard fit. It was a sad day when I found out they were discontinued! Inov-8 still haven't answered my emails, nor my prayers. Fortunately, I managed to secure an extra pair on clearance (which I save for special occasions) and then started to look for replacements. I soon found the Inov-8 X-Talon 200. The X-Talon 200 has come in a range of colors. The pair I have is the second generation black/blue/orange, which is still stocked in a few shops around the web. Pretty much an archetype Inov-8 X-Talon design; black with plenty of orange neon contrast. Later came other colors and today the 200s are completely black with only a few grey contours. Design preference is highly personal, but I like the new black model better - it looks almost stylish. Mind you, X-Talon 200 is not an evening shoe! Its a piece of gear to be worn when going for rugged trail runs - and who is out there to look at your (preferably mud covered) shoes anyway? Below you can see the Inov-8 X-Talon 212 precision fit (red) on the left, Inov-8 X-Talon 200 in the middle and X-Talon 212 standard fit (yellow) on the right. The first thing I noticed with the 200 was a fair amount of room for my toes, and I like that very much! Yet, the fit was snug enough to prevent any blister-provoking inside-shoe sliding. The drop is 3 mm (3 mm less than the 212) and they do feel different, but whether its the drop or not I can't say. The overall feel is not overly different - perhaps a bit to the flimsy side. After a fair number of runs, I realized that the X-Talon 200 does not come half a size small like the Standard fit 212 did. This hasn't, however, caused me any discomfort - but I'll go "true to size" for my next pair of X-Talon 200 (and there is definitely going to be the next pair). At first, the shoes made an annoying clicking noise when they bent, but that has disappeared with milage. In my opinion, they are nice and comfortable for autumn/winter conditions, and a bit too warm/tight for summertime runs. If you are used to a large heel-to-toe drop and plenty of cushioning - the 200 is most likely not for you. The outsole is the same legendary 8 mm lugs as on the X-Talon 212, giving unrivaled grip in tough, muddy and sandy conditions. The spacing of the lugs prevent grit build-up and they are excellent for loose snow/slush, which we get a lot of around where I live. The X-Talons - neither the 212 nor the 200 - work well on hard/solid ice. YaxTrax and similar "ice add-ons" do not go well with the deep lugs. For solid ice, I'd go for Arctic Talon or something similar with spikes. The upper is made of a somewhat lighter and glossy version of the Cordura-like fabric that Inov-8 use in their X-Talon line. I've found that it is durable, comfortable and water repellent to some extent - and very importantly does not allow fine-grain sand or grit to get in! Despite its water-repelling effect, it allows water to drain quickly. There is also a pretty descent toe bumper, which will keep your toes relatively safe from rocks and roots. Mind you, it's not a safety boot - its a rather lightweight running shoe! Together with gaiters, they have gone the distance in everything I have thrown at them - from knee-deep snow and mud, over mountain ranges to seemingly endless sand dunes. One thing to note is that there is no "built-in gaiter attachment" like on the TrailTalon models and some of the newer X-Talon models. I have used my X-Talon 200 on pretty much any terrain. Recently I did a semi-official 60 km mixed beach/road/trail type race, and they held up nicely. No discomfort at all - well, at least not caused by the shoes. Now, after some 850 km of rugged trails, they still hold up. The lugs are no longer 8 mm, and the fabric look pretty worn where the shoes bend, but they are still comfortable. Good solid quality shoes! I expect them to last well beyond 1000 km before retirement. I got mine on sale, but even at the recommended retail price, they are value for money. According to numerous stories around the web, the number on the Inov-8 shoes is supposed to be the weight of a men's UK 8.5. I can't find solid information to back this on the Inov-8 website, so perhaps its just a rumor. 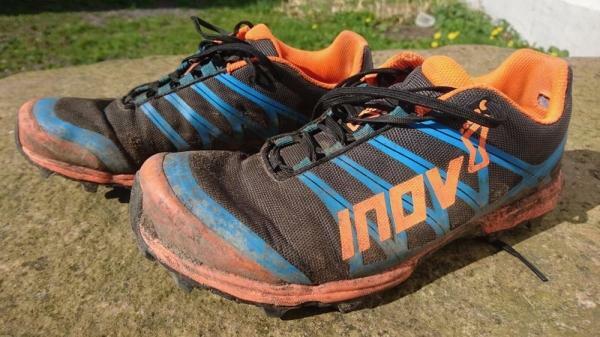 Anyway, as an avid Inov-8 fanboy I have had my fair share of Inov-8 shoes (all size UK 7.5). Let's put them on the scales. My well worn X-Talon 200 currently weighs in at 232 grams. My precious X-Talon standard fit 212 is at 241 grams. The Terra Claw 220 is 227 grams, and Trail Talon 250 is 232 grams. My latest (almost new) pair of Precision fit X-Talon 212 weigh in at a whooping 250 grams. Okay, its a small, somewhat biased sample of mostly well-worn shoes - yet, the numbers are off in all directions. I'd say the numbers are somewhat indicative of weight, at best. The X-Talon 200 is a lightweight shoe that rides low to the ground - excellent for speed and OCR. I'm not a very fast runner (quite the contrary in fact) and I usually employ my 200 for technical and rugged type trails where I need grip and control more than speed - for this they are perfect. I have in several muddy mountainous ultras seen a lot of other runners "slip'n'slide" with no end, while I just kept running like normal in my 200. You simply can't put a price on a good grip in such conditions! Low drop. Little cushioning. Super grip. Excellent fit, despite half a size up. Comfortable with fair room to splay those toes. Some protection against the elements and obstacles. In my humble opinion, the Inov-8 X Talon 200 is one of the best and most comfortable shoes for (ultra) long runs in (cold) rugged/muddy conditions. The Inov-8 X-Talon 200 is my go-to shoe when it comes to running in treacherous conditions, due to its superb grip and roomy toe box. The shoe has aggressive lugs and initially stiff. I presumed a break in period was required. This shoe is designed specifically for muddy, technical trails. I primarily participate in obstacle course races and I expected this shoe would be a good selection on race day. The X-Talon 200 weighs around 7.1 oz or 200 grams, and the shoe has 3mm heel to toe drop. One of the most impressive features of this shoe is the wide toe box it offers, my feet are wider than most and many shoes I have found to be too narrow. The 8mm rubber lugs, offer superior grip on soft terrain but also hold firm on harder ground. The toe bumper is made of rubber, which I have found protects my toes from direct impact from rocks and obstacles. The shoe has a simplistic design with thin underfoot protection. This could be a potential problem for those who are used to a more cushioned shoe. What makes the Inov-8 shoes legendary when it comes to grip are the 8mm lugs on the bottom. These lugs provide unrivaled grip on mud, snow, and other difficult conditions. The outsole of the shoe is compromised of forefoot mesh and a DWR coating. This makes the shoe water resistant, but not waterproof. That being said, this shoe does not have the best breathability or drainage capabilities. Most Inov-8 shoes have the same durable lacing system, which offers an adjustable, yet secure fit. In over 50 runs/races I have never had an issue with the laces coming undone. The heel cup of the shoe is very wide which makes putting on the shoes quick and easy. The tongue of the shoe is very secure and does not slide when running. Overall, it does an adequate job of keeping debris out. This is my go-to shoe when I have a short distance race on a technical or muddy terrain. The 8mm lugs provide grip like no other shoe I have ever worn. This shoe offers good ability to keep water and dirt out of the shoe due to its materials. However, due to the constant change in terrain that I encounter in a Spartan race I often wear an Inov-8 gaiter to help keep debris out. This is one of the few shoes that I have raced in all conditions with such as mud, snow, and water. This shoe has handled all of those conditions very well, however, the two conditions’ that this shoe doesn’t excel in is ice and very rocky terrain. I have had this shoe for a year and a half and it still looks brand new. The shoe is very durable and I will continue to use this shoe for many races to come. This is the shoe everyone should have in there arsenal for trail running and especially obstacle course racing. trail running shoes on the market. I would recommend considering this shoe if you are in the market for a shorter distance trail running shoe. If you compete in obstacle racing this is the shoe you need to have. This shoe is good in every department and the traction is better than any shoe on the market. It's an affordable option and you cannot put a price on the traction that it offers. Bottom line, you need this shoe. Hello, versatility! Inov-8 came in like a wrecking ball on to the obstacle course racing (OCR) scene as these nimble grip-intensive shows changed OCR forever. More than just an OCR race shoe, minimalist trail runners and fell runners alike now have a zippy shoe to help them conquer any terrain (drumroll please) enter the X-Talon 200! Let’s talk about how these shoes, currently my favorite OCR race shoes to date. How could they not be a fan favorite? These shoes are ultralightweight and are fully loaded with 8mm aggressive lugs, making them perfect for gripping soft trails and my personal favorite—obstacle course races! The X-Talon 200 is an impeccable trail/OCR race shoes, weighing in at a mere 200 grams (equivalent to approximately 7 ounces) equipped with a 3mm drop. Despite the minimalistic nature of this shoe, it is incredibly durable, diversifying this trail shoe from all others. If you’re looking to kick your trail running up a notch with a shoe that won’t weigh you down for running on wet, rocky, or muddy conditions…the X-Talon 200 has your back! Never judge a book by its cover. At first glance, I can’t say that I was exactly thrilled with the color scheme options for the X-Talon 200. But hey! If you’re into “loud” shoes, these already are perfect for you. 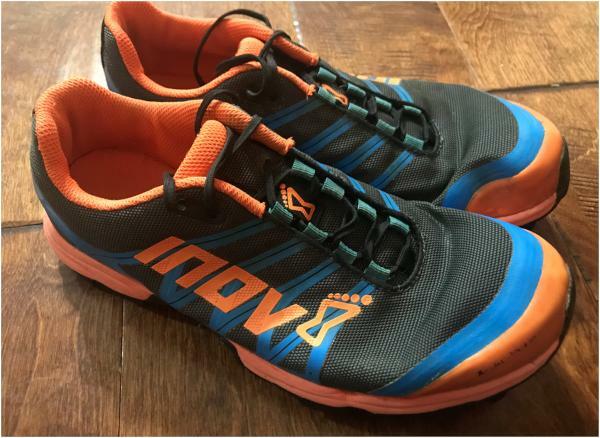 Initially, Inov-8 only released these shoes in blue/orange/black and red/yellow/black, but eventually, they introduced solid color options which I prefer and will be ordering in the future. Let’s be honest, the aesthetics are not a humungous component to fret over as the primary focus is functionality. I found these shoes comfortable right out of the box. I honestly didn’t have time to break them in because I accidentally ordered them too close to an OCR event and I had zero issues racing without breaking them in whatsoever. The shoe is designed with a neutral arch and allows for a natural feel when running in them. Moreover, I was elated to find that Inov-8 offered two widths in this shoe: the standard fit (wider) and precision fit (narrower). After owning a pair of the X-Talon 225 in the precision fit, I was dissatisfied with how narrow. They were and constantly developed blisters. With this previous experience in mind, I opted for the standard fit when buying the X-Talon 200 edition to give them a whirl. I have a normal width foot, but I personally found the precision fit to be a bit too snug, so naturally, I love the standard fit because it is just roomy enough in the toe box to allow for the toe splay I desire when I’m racing and running. I couldn’t be happier! As far as sizing goes, I also knew from previous experience that Inov-8 tends to run on the smaller side, so I ordered these shoes a half size up, and I am glad that I did. Despite running on the smaller side, I don’t believe you would need to order a full size up if you’re thinking about ordering these shoes. The half size increase was just the size I needed for a great fit. Comprised of synthetic material and a double water resistant coating, these shoes stay dry in wet conditions. I wanted to further expound on how well these perform in “wet conditions.” I’ve ran in these shoes in both rainy and snowy conditions, and they performed fabulously. As far as OCR goes, it’s not atypical to have your feet completely submerged in water. This can be problematic because the X-Talon 200 does not shed water very well after full submersion. So, this really isn’t the end of the world; it just is a slight inconvenience. The shoes are so light in weight that even in the event that they hold water in a race, it doesn’t make the shoe that much heavier. What actually happens is the water just sloshes around in your shoes for a bit — no big deal. I still love them! Moving on from the poor water shedding capabilities, the uppers are designed to be breathable whilst keeping the foot cool and dry. So, if you’re looking to run in these and you’re not planning on submerging your feet, they are quite phenomenal. Armed with 8mm aggressive lugs, these shoes will have you race ready for any extreme terrain. The grip provided by the X-Talon 200 is unprecedented! If you have these shoes in your arsenal, you’ll certainly be ready to take on mud, rocks, soft trails, or any rugged terrain ahead of you. The shoes are comprised of a sticky outsole, but for OCR I found that these shoes can be quite slippery on wet wooden obstacles. Even then, they still perform quite well. On the other hand, the grip is also killer on any dry wooden obstacle, so that’s a plus! Another cool feature is the protective rubber toe bumper. Like many, sometimes on longer runs, I can get lazy with my footing, so the toe bumper has been a lifesaver for me. It has done a fabulous job protecting my feet while accidentally kicking rocks and roots while trail running (I love it)! I also love the fact that these shoes have nifty features like this and remain light in weight. Genius on Inov-8’s behalf! Comprised of injected EVA cushioning, the X-Talon 200 offers a comfortable ride for a minimalistic race shoe. The injected EVA cushioning is how Inov-8 is able to make these shoes so light in weight. Unfortunately, this is where you’re trading a degree of comfort for a lighter weight shoe. While running on intense rooty and rocky terrain, you’ll feel the ground beneath you. Let me be clear, it’s still quite comfortable! It may be a far cry away from an orthopedic yoga mat footbed, but when you use these shoes for their intended purpose such as racing, you’ll be pleased with the design. Inov-8 most certainly had the obstacle course racer in mind when designing these shoes. As previously mentioned the X-Talon 200 is incredibly lightweight and even feel quite minimalistic, making them fabulous racing shoes. I literally feel like I am wearing socks with lugs, these shoes are so lightweight - it’s great! I also love that my feet still feel protected while I’m racing or trail running in these shoes and I do not have to compromise weight in order to do so. It still boggles my mind how durable, yet light the X-Talon 200 shoes are. Furthermore, I love the eyelets on these shoes. The laces are pretty narrow, and the design of the eyelets allows the midfoot to really feel snug and secure when lacing up. Every obstacle course racer’s dream is to have a lightweight and grippy shoe which also encompasses stellar water shedding capabilities. The only issue I’ve come across with the X-Talon 200 shoes is their poor ability to shed water. 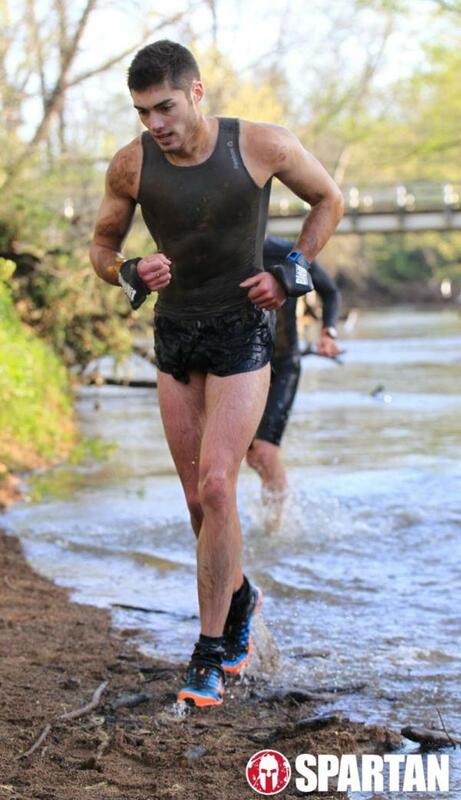 The fact of the matter is that wet shoes become cumbersome and heavy for OCR races. Perhaps, using a different synthetic overlay material that allowed water to drain more readily would be a possible advancement for these shoes. Otherwise, if you’re not planning on using these shoes for OCR, they are a fun, zippy, light ride that will have you running at the speed of lighting! A shoe 7 ounces with marvelous grip and protection? It doesn’t get much better than this! Not to mention, this shoe holds up incredibly well after countless trail runs and races. I’ve easily ran 65+ miles in these shoes, and they’re just as comfortable (if not, even more comfortable) than the day I bought them. Plus, despite the higher mileage, you’d never know it due to their durable design. So, if you’re looking for a stellar race shoe or lightweight trail shoe for tempo runs, these shoes are the perfect shoe for you! Worried about width? Keep your mind at ease as the standard fit might be all that you’ve ever needed. Life is too short to be racing in the wrong shoes. So, whether you’re into bold and bright colors or solid hues, the Inov-8 X-Talon 200 shoes are here to suit your personal shoe preferences. These are my go-to OCR race shoes, and I rate them an A+ in my book! The Inov-8 X-Talon 200 features an enhanced upper built. The upper materials have water resistant coating that keeps water and mud from entering the shoe, allowing the foot to stay drier for the entire run. It also comes with added protection. The rubber toe bumper is designed to protect foot from sharp rocks and obstacles. The sturdy Rope-Tec rubber gives protection against foot irritation and blisters especially on uphill runs and down ropes. The X-Talon 200 has a standard running shoe length and width. It has enough space in the heel and forefoot without feeling sloppy. The forefoot has enough space for toe splay. The midfoot delivers a snug fit. Generally, it gives comfortable fit to most runners. The outer sole of the X-Talon 200 features the brand’s Rope-Tech outsole technology. It gives enough amount of traction and durability. It also has the rubber toe bumper that gives protection against stone bruising and sharp stones during trail running. This shoe uses the traditional injected EVA that delivers enough cushioning. It efficiently absorbs shock during impact and delivers solid rebound for a responsive cushioning. The midsole gives soft underfoot comfort for medium-distance runs. The upper of the Inov-8 Talon 200 uses synthetic material for a maximum breathable coverage. It keeps the cool and dry. With the double water resistant coating, the foot is kept drier even on wet condition. This coating technology also prevents mud and dirt from entering the shoe while keeping comfortable. The Reinforced TPU overlays give maximum comfort and adapts to multiple running environments.